If your organization is growing, so are your technology requirements. At some point, you’ll need more electrical outlets than you have. Power strips may be enough for home offices, but anyone with plans for growth should understand the benefits of using a PDU. This guide will review the basics of power distribution for business environments to help you make a confident and informed buying decision. First things first. What is a PDU? 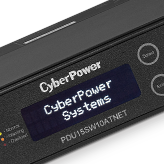 A power distribution unit (PDU) distributes reliable network power to multiple devices. 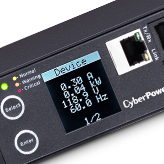 It does not generate or condition power, but delivers AC power from an uninterruptible power supply (UPS), a generator, or utility power source to servers, networking hardware, telecom equipment, and other devices. What does a PDU do? In its most basic form, a PDU does the same job as a power strip. It uses current from a single source, usually a wall outlet, to power multiple devices, such as computers, peripherals, and networking gear. PDUs are designed for installation in equipment racks, keeping power within reach of rack mounted devices such as servers, switches, routers, or cooling fans. PDUs are most often used in data centers, network closets, VoIP phone systems, and industrial environments. 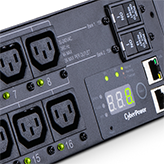 Beyond standard power distribution, PDUs are for in-depth power management and monitoring. Below are eight of the most common PDU types available on the market. Do PDUs provide surge protection? 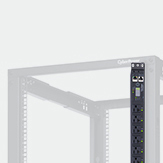 Rack surge protectors distribute power from a single source to multiple devices but are not strictly PDUs. They are designed for use with equipment that needs to be guarded against voltage spikes and surges but does not require battery backup. Because the primary feature of these units is protection against over voltages, they are considered surge protectors and not PDUs. Which type of PDU is right for me? To find the right model for your needs, ask yourself the following six questions. 1. Where will I install it? 2. What kind of input power do I have? 3. How much power does my equipment need? 4. 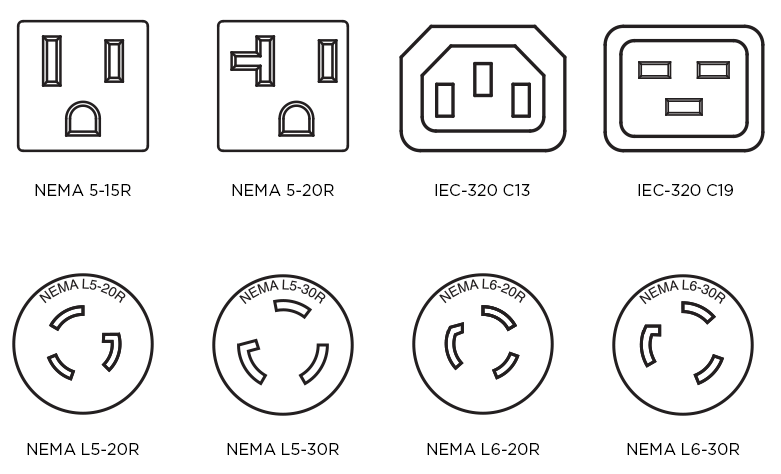 How many outlets do my devices need? 5. 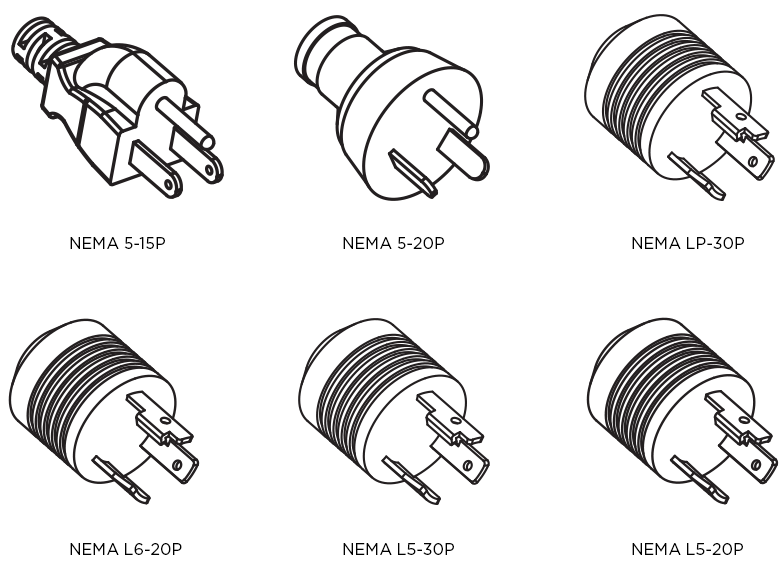 What kinds of plugs do my devices have? 6. Do I need other features? PDU models are typically available in 1U or 2U heights for horizontal mounting. They can also be mounted vertically, known as 0U. Depending on the model, they can be mounted in a rack enclosure, on a wall, or under a shelf. 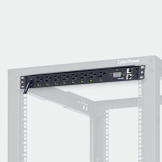 Horizontal PDUs are designed for mounting in EIA-310 standard 19-inch equipment racks. They can be placed above, below, or between the components they power. Vertical PDUs look like tall power strips. They fit on the upright rails of a rack enclosure and do not take horizontal mounting space away from other equipment. Three-phase power eliminates these moments of zero voltage by offsetting three simultaneous waves. When one wave reaches zero voltage, the other two are at positive and negative points in the cycle. Three-phase power is common in commercial and industrial environments. Most offices have single-phase power—but make sure you know before buying any new equipment. The amount of power consumed by each device should be listed in volts and amperes (VA) or in watts (W) in the user manual or on the equipment itself. Add up the total consumption for your equipment and write it down. Your power source—utility power from a service panel, local power from a generator, or backup power from a UPS—should be higher than that. 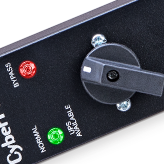 Note: Many devices use automatic switching power supplies that can be used with voltages from 120 to 240. If your power source is 120V (typical for North America), base your calculations on that figure. If it’s 200V/230V (typical for Europe and Asia), use the higher number. For input amperage, use the figure listed on the device or in its user manual. One PDU connected to one UPS can provide conditioned power to a smaller network. Larger and more complex installations may need multiple PDUs and a large-capacity UPS system. This question is probably the easiest to answer, but take it seriously. The PDU you choose should have at least as many outlets as the number of plugs you need to connect. If a device has more than one plug, or if one device has to be plugged into another, adjust your count. And remember to leave room for more devices, such as lights or cooling fans. 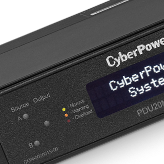 A basic PDU shares a single power source with multiple devices. It simplifies the management of rack equipment and makes a valuable addition to any IT installation. Advanced models do much more, from measuring demand to protecting against downtime to allowing remote control through software. 1. 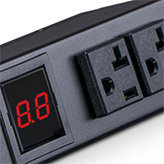 A Basic PDU distributes unfiltered AC power from a UPS system, generator, or utility source to multiple connected devices. 2. A Metered PDU distributes network-grade power and meters load in amps to prevent overloads and help users optimize load levels. 3. A Monitored PDU distributes network-grade power and helps users prevent downtime due to overloads or other power events. It supports local management with a digital meter display and remote monitoring through an SNMP network interface. 4. 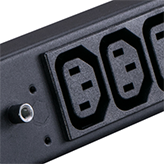 A Switched PDU distributes network-grade power and allows users to control outlets individually or collectively. A digital meter provides information on load and voltage and supports local control; an SNMP connection enables remote monitoring and control. 5. 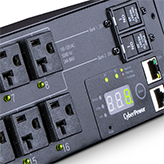 A Switched Metered-by-Outlet PDU combines network-grade power distribution with local and remote outlet-level monitoring and control. It allows remote switching for unscheduled reboots, automated load shedding, controlled power cycling, and more. Power event notifications by email or SMS text help users mitigate risk. 6. A Metered Auto Transfer Switch (ATS) PDU receives unfiltered pass-through power from redundant plugs connected to separate power sources and distributes it to single-corded connected equipment. An LCD screen displays amperage, input and output voltage, active consumption in kilowatts, and hardware and firmware information. An optional SNMP card allows remote monitoring and management. 7. A Switched Auto Transfer Switch (ATS) PDU has all the features of a switched PDU, plus the ability to connect separate power sources to single-corded connected equipment for redundancy. An LCD screen can display amperage, input and output voltages, active power consumption in kilowatts, and information about hardware and firmware versions. A standard SNMP card allows remote monitoring and management over a network connection. 8. A Maintenance Bypass PDU helps prevent downtime. It allows the seamless transfer of an electrical load from UPS power to utility power for continuous operation of connected equipment when performing maintenance, replacing batteries, or installing a new UPS. Use our PDU product finder to compare features and review detailed specifications side by side. And if more questions come up, don’t worry; just contact our power distribution experts.